Upon request we are happy to provide our premium cars with the DEKRA Seal certificate. A DEKRA expert will conduct an objective, independent inspection according to strict quality criteria. We guarantee that these criteria will be adhered to. Our experts only issue a vehicle with the DEKRA Seal for pre-owned vehicles when it has met certain minimum standards in various component groups. This gives you an objective report on the quality and condition of the vehicle – defects and necessary repairs are outlined in the test documentation. Even if a vehicle does not meet the criteria for the DEKRA Seal for pre-owned vehicles and thus cannot receive a certificate, the test report gives both purchaser and seller a neutral assessment of the condition of the vehicle. The following 8 component groups on the vehicle are subject to the quality criteria in the DEKRA Seal for pre-owned vehicles. If the test involves a truck, motorcycle and leisure/travelling trailers, the test points are expanded as necessary, e.g. the driver’s cabin of the truck or the dampness in a caravan. The body parts are not restricted or defective in their function. No residual traces of an accident can be detected. There are neither dents or bulges or other large areas of damage. No strong signs of corrosion damage or impact damage. The paintwork does not display obvious signs of stone chipping damage, or large scratches that reveal bare metal. The paint finish has been professionally applied (differences in colour tone). Add-on parts must not be missing or severely damaged. The screens must not require renewal. The tester should detect no odours in the interior that could be deemed highly unpleasant. Seats must not display signs of heavy wear or burn marks. The seat mechanics must be in order. The trim, ceiling or the carpet must not display serious damage or be heavily soiled. The controls must not be defective in any way. Heating and ventilation must be without defect. The engine must not suffer from severe oil loss. The oil level of the engine must be sufficient. Transmission or axle drive must not display severe oil loss. The cooling system must be without defects. There must be sufficient coolant. The amount of anti-freeze in the coolant must at least comply with the manufacturer's recommendations. The exhaust must not display severe damage and functional damage. The exhaust must have been properly maintained. A test drive must not reveal any atypical noises from the engine, axles, transmission or automatic transmission and no other defects should be detected. The tyre tread must not be less than 3 mm. The rims must not show signs of severe oxidation or damage. The spare tyre must be functional, the tread depth of the tyre must be at least 2 mm. The brake lining and discs must not have reached their wear limit. The water content of the brake fluid must not be more than 3%. Control devices and instruments must not be defective in any way. Electric windows must not display any defects. The electric sliding sun-roof or cover must work. The air-conditioning system must be fully functional and must not be defective. Electric seats and seat heating must be in perfect working order. The main inspection sticker must still be valid for at least 21 months. For cars without catalytic converter or with an open-loop catalytic converter, the exhaust emissions analysis sticker must be still valid for at least 9 months. For classic cars the following applies: Petrol-driven cars first registered before 1st July 1969 and diesel-driven vehicles first registered before 1st January 1977 are exempt from the exhaust emissions analysis stipulation. For taxis and hire cars the following applies: The main inspection and exhaust emissions analysis stickers must still be valid for at least 9 months. 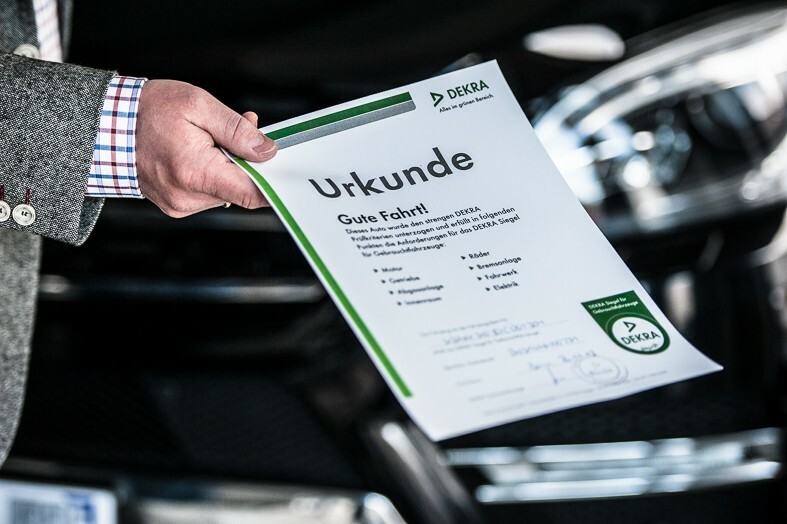 Regular customer services as recommended by the manufacturer are included in the test for the DEKRA Seal for pre-owned vehicles.